I post a lot of blue dining rooms. Truth be told, I gravitate towards blue for just about everything. It's my color, I suppose. Remember those built-ins in the formal? I've been thinking about painting those out, and guess what color pops into my head again and again? And I can't wait for it to warm up so we can paint the door to the garage a bright . . . blue. Except not. I'm trying really hard to get away from this, as I know that we can't live in an entirely blue house, but it's just such a great color! At least Monday Blues lets me live in all of the blue spaces I want. ha! Does anyone else have a go-to color that won't quit? You know I won't judge. 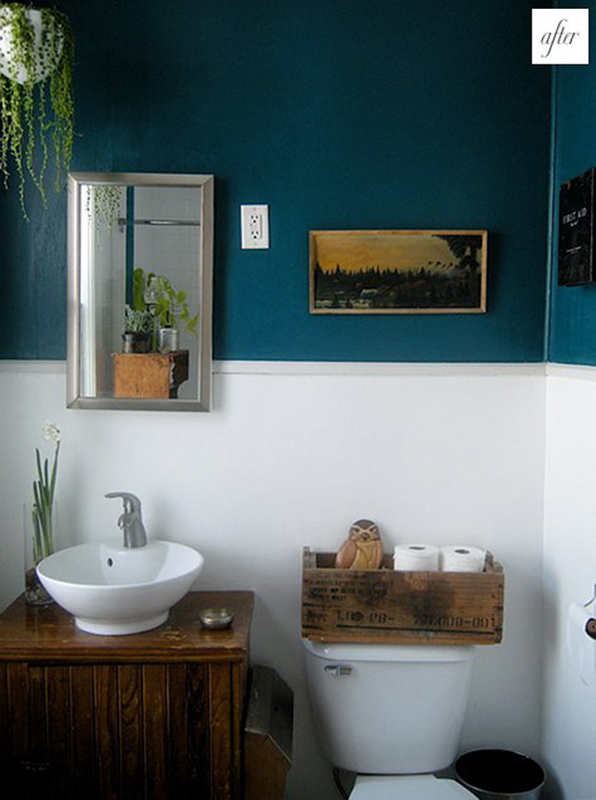 The color of this bathroom is Realm by Behr...I have a sample up in my bedroom and it's VERY pretty! LOVE the idea of painting those built ins!! Gray and super dark blue. I love dark walls for some reason. I also love blue. I think there is also something great about using color dramatically - whether it is the statement color wall, or really going full on an all out with everything in shades of a hue. For me, blue is a neutral....but that may be because I grew up by the sea!